A binding that declares, Good Grieve! ; an American binding that finally shows up amidst all the Anglos; a binding romance at Oxford; a neoclassical binding of an acclaimed edition of the Bible; a Riviere runs through it; and American television's most popular variety show host of all time, purposely confused with an accomplished binder for a cheap laugh, close Booktryst's Bound to Great Week. The Lives of Illustrious and Eminent Persons of Great Britain. London: Printed for Longman, Hurst, Rees, Orme, and Brown, 1820. Later binding by Andrew Grieve. The covers to this attractive and animated, gilt and inlaid brown morocco binding are bordered by multiple plain and decorative gilt rules enclosing an unusual gilt frame of baroque-style flowers, leaves, volutes, swirls and quatrefoils, cornerpieces of inlaid red morocco quatrefoils outlined in gilt, a central panel dominated by a red morocco oval medallion adorned with a gilt laurel wreath, the oval with four red morocco petals from which spring gilt fronds and quatrefoils, these terminating at the top and bottom of the panel with ochre morocco-outlined mandorlas containing a gilt floral sprig, the background of the panel exuberantly decorated with many small gilt flowers, inlaid green morocco dots, ochre morocco half moons, and assorted small tools. 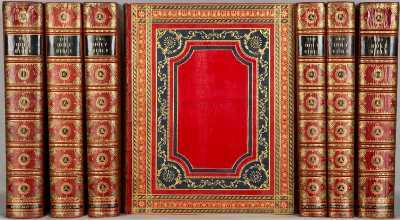 Raised bands, elegantly gilt spine compartments with central red morocco oval framed in gilt and with olive branch cornerpieces, turn-ins with gilt frames, marbled endpapers, and all edges gilt complete the binding. 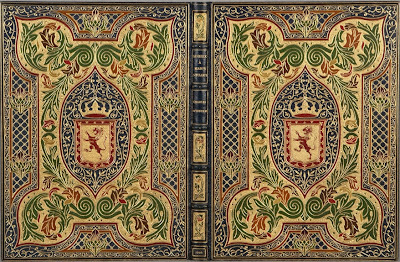 This binding is the work of Andrew Grieve of Edinburgh, the teacher of Charles McLeish, who, for sixteen years, worked as a finisher for at the Doves Bindery under the supervision of Cobden-Sanderson. SHERARD, Robert Harborough. Oscar Wilde: The Story of an Unhappy Friendship. London: Privately printed at the Hermes Press, 1902. Prominent New York binder Henry Stikeman wrought this handsome and elegantly gilt Art Nouveau binding in olive green morocco. 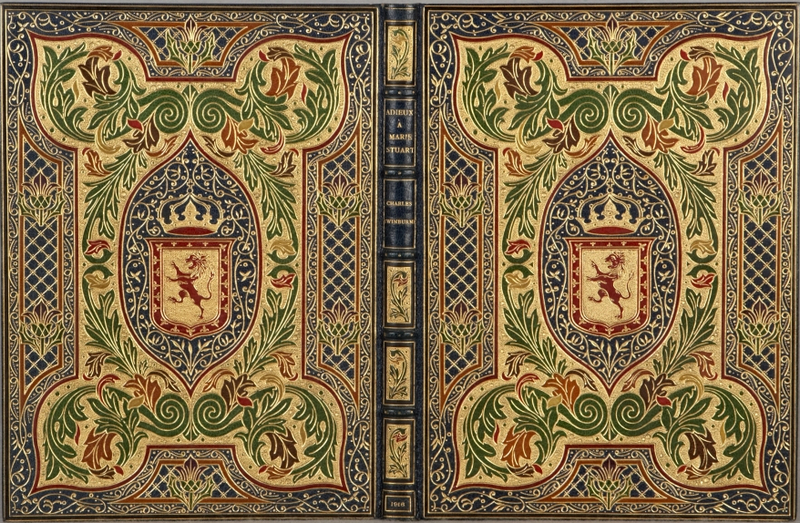 Its covers possess multiple plain and decorative gilt rules enclosing a large quatrefoil with very prominent floral cornerpieces and floral tool accents, the central panel on the upper cover containing a coronet imposed upon crossed writing tools. Raised bands, attractively gilt compartments with a large central lily framed by drawer handle tools, intricate gilt floral turn-ins, marbled endpapers, and top edge gilt finish the job. Beginning toward the end of the nineteenth century into the beginning of the twentieth, Henry Stikeman’s career laid at the center of art bookbinding in America. A Stikeman binding from the 1880s through 1918-1919 represents the firm's best work. Like a number of Stikeman bindings, this one reflects the contents of the book: the tooling employs the rounded geometrical shapes familiar from the Art Nouveau, and makes prominent use of lilies, Wilde's signature emblem and favorite flower. Oxonii: E Typographeo Clarendoniano, 1813. 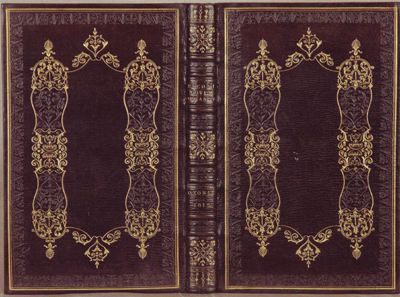 Contemporary binding by John Rodwell of Oxford. This mainstream Romantic-period binding, elaborately decorated in gilt and blind by John Rodwell of Oxford on deep purple straight-grain morocco, features covers with a gilt-ruled border and intricate blind-tooled vegetal frame, a central panel with two very complex elongated ornaments in blind and gilt with palmettos, curls, and many small tools, these attached at the head and tail by graceful gilt tendrils with scroll and foliate accents. 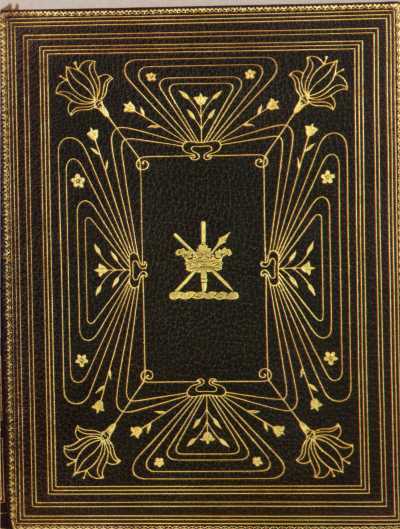 Four pairs of raised bands with blind tooling between each, densely gilt spine compartments, broad floral decorated turn-ins, blue moire silk endpapers, and all edges gilt complete the binding. This volume, published in Oxford by Oxford's Clarendon Press and bound by Oxford's John Rodwell, screams...Oxford! John Rodwell did not produce a great many bindings (ABPC records fewer than half a dozen, none later than 1820), but his firm obviously produced fine, distinctive work. (Bible in English). The Macklin Bible. [final volume Bensley for Cadell & Davies], 1800. Contemporary binding by Georg Friedrich Krauss. Georg Friedrich Krauss is responsible for this magnificent contemporary neo-classical-style binding of the seven-volume Macklin Bible. 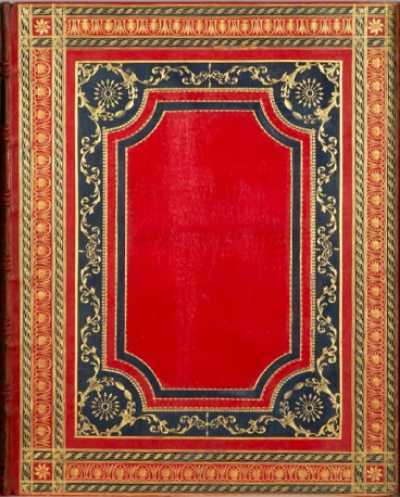 Bound in sumptuously gilt and blue-inlaid red stright-grain morocco, it was executed for Duke Albrecht of Saxe-Teschen (with repeated "A S T" monogram). The covers feature elaborate frames incorporating eleven plain and decorative gilt rules, four inlaid borders of blue morocco, and elegant swirling foliate ornamentation around the central scalloped panel. Six pairs of raised bands, each flanking a recessed gilt and blue metope and pentaglyph rule, very handsome spine compartments with blue fan-shaped cornerpieces and central gilt-decorated blue medallions within sunburst gilt collars, turn-ins with Greek key pattern in gilt, striking endleaves of turquoise and green watered silk (the Apocrypha endleaves slightly different), finish the binding. The most prodigious form of scripture in English ever published, the Macklin Bible was often put into ornate bindings, especially by London binders like Staggemeier and his contemporaries. In Vienna, Georg Friedrich Krauss (1806-1876) was the most prominent German bookbinder of his day, and the Duke of Saxe-Teschen was perhaps his most important client. Works from the Krauss bindery have passed through some of the most distinguished collections over the years. SWINBURNE, Algernon Charles. Adieux à Marie Stuart. (1916). Illuminated manuscript, calligraphy by Alberto Sangorski. Binding by Riviere & Sons. A stunner in elaborately gilt and inlaid dark blue morocco by Riviere & Sons, this manuscript was designed, written out, and illuminated by Alberto Sangorski. The covers bear a central red morocco escutcheon featuring a rampant lion on a field of densely stippled gilt with the royal crown above it in red morocco and gilt. The crown and shield are both inside a blue mandorla decorated with twining vines, the mandorla, in turn, enclosed by a large frame with lobed cornerpieces, this frame heavily stippled with gilt and inlaid within an exuberantly decorated gilt border outlined by a thin strip of inlaid black morocco and filled with gracefully swirling vines and curls, with each of the four sides of the frame with an ochre morocco-outlined, gilt-latticed compartment with one or two inlaid thistles in green, purple, and gilt. 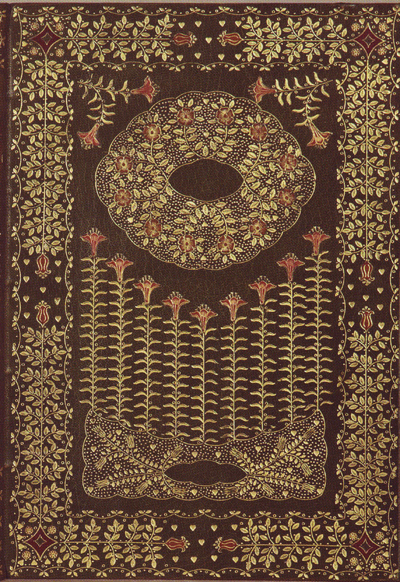 Raised bands, spine gilt in similarly stippled compartments containing an inlaid acanthus leaf, turn-ins with inlaid black morocco strips enclosing a repeating pattern of gilt leaves, berries, and azured acanthus leaves, ivory moire silk endleaves, and all edges gilt complete this lily already golden. Designed and illuminated by Sangorski with thirteen three- to four-line initials in red or blue, five red initials of similar size with penwork, two four-line initials in green, purple, and burnished gold, and six large illuminated initials elaborately decorated with flowers and acanthus leaves in shades of purple, mauve, and indigo, all on grounds of burnished gold, three with extensions of flowering stems, title page with lovely frame in purple, blue, and burnished gold emanating from the "A" in the first word of the title, the burnished gold letter containing a large Scottish thistle, first page of text with swirling red hairline borders at head and tail, with blue flowers, thistles, and numerous leaves and bezants of burnished gold, the first word, "Queen," having a large gray initial with white tracery and large brooch ornament at the center, the other letters in burnished gold, all on an elaborately checkered background, the page opposite with a large miniature of Mary Stuart gazing mournfully at France from the stern of a ship boumd for Scotland based on a painting by W. P. Firth and signed with Sangorski's cipher (dated 1916). Calligrapher and illuminator Alberto Sangorski (1862-1932) was the older brother of Francis Sangorski, co-founder of the renowned Sangorski & Sutcliffe bindery. Alberto, who had started his professional life as secretary to a goldsmith's firm, became attracted to the book arts at age forty-three and began illuminating manuscripts that were then bound by his brother's firm. Sometime around 1910 Alberto and Francis had a falling out, and the artist went to work for the rival Riviere bindery. Riviere's workmanship here is, as usual, first rate, as are the materials used, and the book is a shimmering example of 20th century handcrafted book art. Sangorski's one-of-a-kind manuscripts are highly prized in collections and in the marketplace. BEDIER, Joseph. The Romance of Tristan and Iseult. 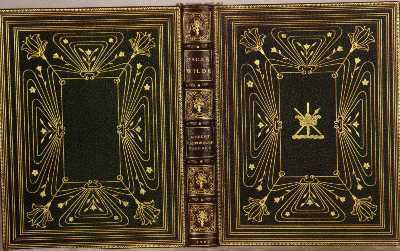 Contemporary binding by Sir Edward Sullivan. 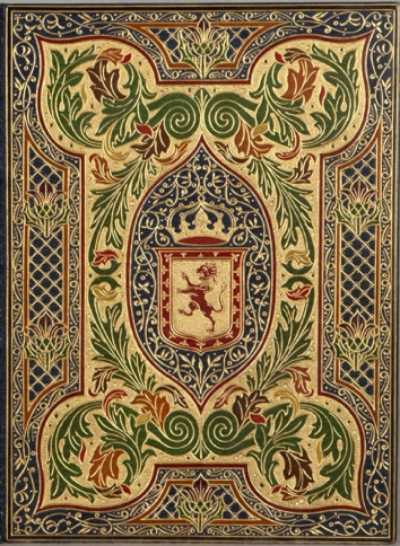 This exuberantly gilt and inlaid green morocco binding by the Irish binder, Sir Edward Sullivan, is highlighted by more than fifty large floral inlays. The front cover features a wide, scallop-edged gilt frame filled with leafy gilt stems terminating in inlaid orange tulips in the middle of each side, diamond cornerpieces in maroon morocco accented with small morocco daisies and gilt tools. The upper third of the central panel has a prominent and densely gilt oval wreath with inlaid pink roses and leafy stems, all against a stippled background, and a spray of inlaid pink and gilt lilies in the corners above the wreath. The lower two-thirds of the panel feature a particularly striking design incorporating nine long-stemmed gilt lilies with inlaid pink blossoms emanating from a base filled with flowering gilt vines and heart tools against a stippled background. The lower cover possesses a similar though simpler design. The spine reiterates the design elements. Gilt and inlaid turn-ins repeating the covers' design, and all edges gilt put the star atop the tree. 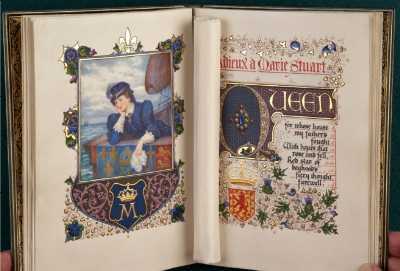 Sir Edward Sullivan (d. 1928) "was a noted Irish barrister who was interested in both the craft and history of binding. He practiced tooling in gold, signing his work E.S. Aurifex, 'aurifex' indicating that he was responsible for the gold-tooling. According to Sullivan, binding as a craft had become sterile and he, like Cobden-Sanderson, wanted to promote originality of design, declaring 'I see no reason why Ireland should not take the lead in changing all of this'" (J.P.M. Marks, The British Library Guide to Bookbinding, p. 28). 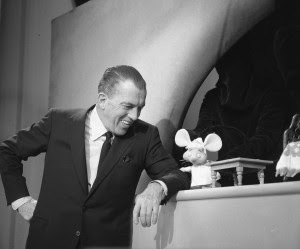 Topo Gigio, share a candid moment. Sullivan was known as the "seriously over-dressed binder." Friday: Drop-Dead Gorgeous Bindings, Bound To Be Great. Sullivan's work is like something straight out of one of my childhood dreams!